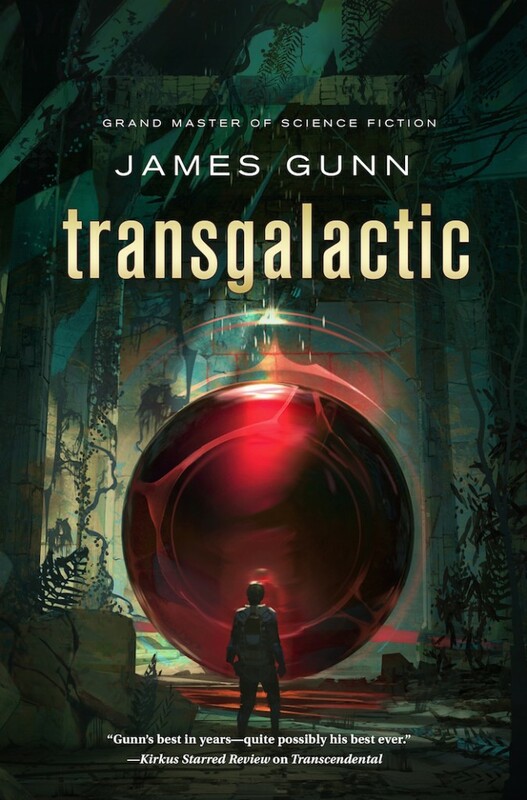 Home > Books > James Gunn’s TRANSGALACTIC Now on Sale! An epic, character-driven, high-concept space opera, TRANSGALACTIC is a real departure for Gunn. It’s a suspenseful novel with unexpected plot twists, set against a deeply spiritual quest—a grander scope and higher concept than anything he’s done before. When Riley and Asha finally reached the planet Terminal and found the Transcendental Machine, a matter transmission device built by an ancient race, they chose to be “translated.” Now in possession of intellectual and physical powers that set them above human limitations, the machine has transported them to two, separate, unknown planets among a possibility of billions. Riley and Asha know that together they can change the galaxy, so they attempt to do the impossible–find each other. JAMES GUNN is the Hugo Award-winning science fiction author of The Joy Makers, The Immortals, and The Listeners, and the coauthor, with Jack Williamson, of the classic epic SF novel Star Bridge. He lives in Lawrence, Kansas, where he is professor emeritus of English at the University of Kansas. He is the founding director of KU’s Center for the Study of Science Fiction. Gunn was inducted into the Science Fiction Hall of Fame in 2015. He is also one of the last living Grand Master Award winners of the Golden Age of science fiction. Tor Books, an imprint of Tom Doherty Associates, LLC, is a New York-based publisher of hardcover and softcover books. Founded in 1980, Tor annually publishes what is arguably the largest and most diverse line of science fiction and fantasy ever produced by a single English-language publisher. In 2002, Tor launched Starscape, followed by Tor Teen, imprints dedicated to publishing quality science fiction and fantasy for young readers, including books by critically acclaimed and award winning authors such as Cory Doctorow, Orson Scott Card, David Lubar and Kendare Blake. Between an extensive hardcover and trade-softcover line, an Orb backlist program, and a stronghold in mass-market paperbacks, books from Tor have won every major award in the SF and fantasy fields. In addition, Tor Books has been named Best Publisher 26 years in a row in the Locus Poll, the largest consumer poll in SF.